My idea for this costume came from my love of the Little Mermaid and aquatic life. 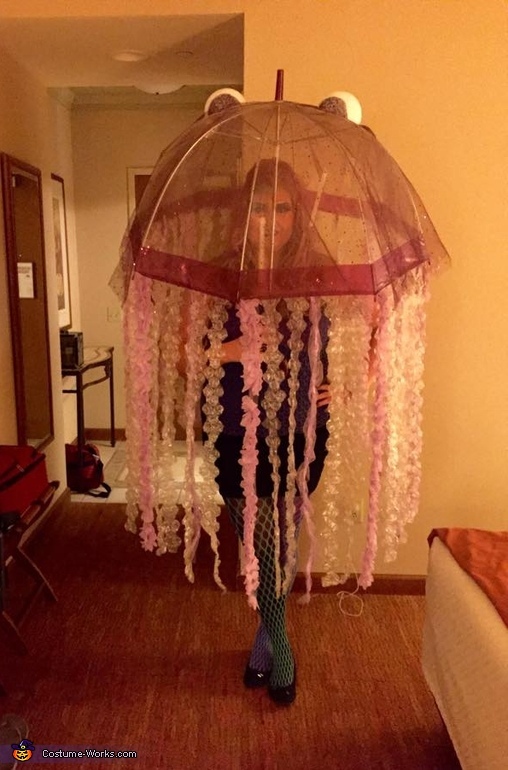 I wanted to create a larger than life Jellyfish costume to show off my big personality. I love the fact that jellyfish can be dangerous, as well as beautiful. To create this one of a kind costume, I started with a clear dome umbrella. For my supplies to complete the costume, I purchased a roll of large bubble wrap, tulle, flower leis, ribbon, one large Styrofoam ball, glue sticks and a hot glue gun,thread, needle, a black permanent marker, purple glow sticks, purple glow necklaces, toy bubble gun, and sheer fabric. I purchased the supply items at the craft store and a large mass retailer. The first step in making this unique disguise, was to measure the length of my body, in order to get the correct length that I would need to have the tentacles all be the right size to stop at my knees. After I had my measurements, I unrolled the bubble wrap and used a craft scissors to cut out all of my tentacles. I used the entire roll. Then I used the tulle and cut out the exact same size strips. I then used purple flower leis all cut apart to create some depth for the tentacles next. I used a hot glue gun to adhere the petals to the tulle. Other tentacles I hand sewed the ribbon through the tulle strips to create wavy effects. After I had all of my tentacles completed, I used the glue gun to adhere them to the umbrella. I hot glued all of the tentacles to the inside bottom of the umbrella. After it was dried, I glued two yards of sheer fabric with sequins on it (resembling bubbles) to the top,and cut the fabric in wavy cuts at the bottom to look like it was swimming. Then I cut my Styrofoam ball in half and drew pupils on each half. I glued them to the top. I then used glow sticks to light up the inside of the costume. I also had a light up toy bubble gun that I purchased from a mass retailer to wave around to look like I was really underwater. For my actual clothing, I just looked in my own closet. I have a purple tank top that looks like scales, so I thought that that was a perfect choice. I also wore my favorite black skirt. I bought two pair of nylons at the Halloween store to make it look like my legs were really made of scales. One pair was a two tone purple and black pair, and the second pair I layered over that, was blue large net fishnets. I wore my own black flat shoes. I added my own black jewelry as well. I wore purple glow necklaces too. When I stepped into the Halloween party, I immediately sprayed my toy bubble gun to look like I was really swimming in the sea. People came up to me all night long to take photos with me and to compliment my talent. The guests all were fascinated by my unique costume. One lady told me that she has "Never seen anything like this and I am stunned, its fantastic!" Another party guest told me that he thought I was "absolutely breathtaking and it is a beautiful costume." The host of the party told me that I was "Amazing, this looks incredible!" I was announced on the microphone by the DJ, and the host wanted to take my photograph for the venue website. People came up to me all night long to compliment me and to dance with me. Some ladies even wanted to step inside and dance under the dome with me! I spun the umbrella around to move the tentacles and make myself swim. Everyone thought that the bubble gun was "! So fun!" "Great touch". Overall, this was received very, very well and I was the center of attention the entire night. I believe that this costume is not only unique, but also breathtaking. My favorite holiday is Halloween and I look forward to making my costumes every year. I have always loved aquatic life so this was the perfect choice for me. No one has ever seen this before, and I was the star of the show at the party. I believe that I should be selected to win the contest because it is original, and very thought out. Every single detail was meticulously thought out. My nails were painted to look like bubbles. My eye makeup was designed to resemble two fish blowing bubbles. I also used fishnet nylons to create scales on my face with shimmer eye shadows. I spray dyed my hair purple to disguise my blonde hair; I wanted to really blend in with my purple dome. The clothing and my costume blended so uniquely and it is definitely one of a kind.